Electra Meccanica President Mark West, left, speaks at the store opening with company CEO Henry Reisner. VANCOUVER — Electra Meccanica, which expects to begin delivering Solo single-seat battery-electric vehicles this spring, is open for business. 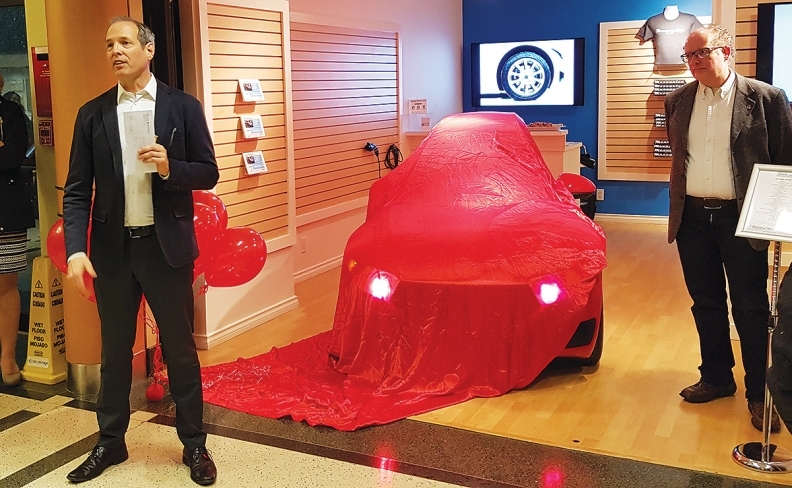 The tiny space, tucked into a well-travelled corridor of an underground shopping mall in the downtown Vancouver Bentall Centre, has room for a display vehicle, brochures and company swag. The Vancouver-based company also plans a second Solo store in suburban Richmond, B.C., president Mark West said at the February grand opening. Electra Meccanica, an outgrowth of long-established custom-sports-car builder Intermeccanica, expects to deliver vehicles to its first B.C. customers in May, West said. Sales to customers outside the province await completion of compliance-certification testing by U.S. and Canadian regulators on a pre-production unit, expected in the second half of 2017, he said. “It’s just a normal process that anyone has to go through,” said West. Electra Meccanica has 475 refundable deposits of $250 from customers interested in the three-wheeled Solo, which retails at $19,888 before any EV incentives are applied. The company plans initially to market the Solo in B.C. and down the U.S. West Coast but has ambitious plans for China, where one of its five pre-production vehicles was sent, and Europe. The Solo is pitched as the ideal vehicle for single occupants who commute 50 kilometres or less. It’s claimed to keep up comfortably with freeway traffic and have a range of up to 160 kilometres. The Solo is currently being assembled in a suburban Vancouver facility. Company founder Jerry Kroll recently posted on Electra Meccanica’s blog that he had toured a plant in China that will begin supplying parts for the Solo later this year, and eventually complete cars. Kroll told Automotive News Canadapreviously he hoped for a production capacity of up to 100,000 vehicles.